. . . no small feet: Not enough expletives here? I can always add more! Not enough expletives here? I can always add more! on the wall for appliances. I have waited a few days to write about this frustration. Perhaps this way you will be subjected to fewer expletives. I am not promising. 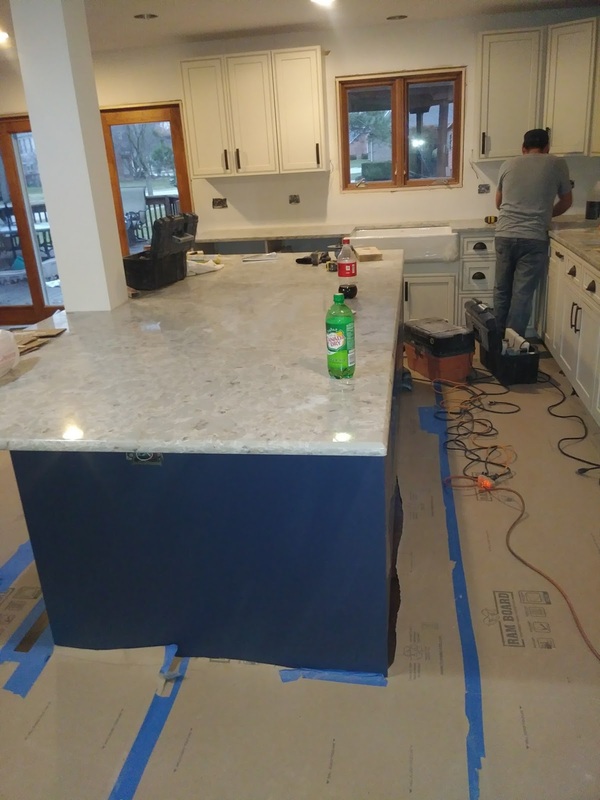 The countertops were delivered on Wednesday. December 13th. They look amazing! Super exciting. At last. 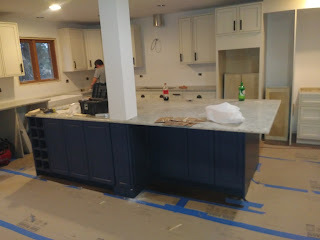 I was eagerly awaiting the appliances that were set to arrive the next day. Ah, function. You know where this is going, right? I can't get over the size of the island. 11 feet by 5! 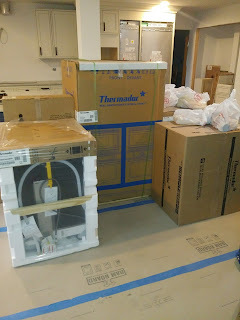 The appliances arrived first thing Thursday morning. Sweet. After 16 weeks, it was all coming together. The contractor had agreed to install them, so this was just delivery. I was suddenly a bit panicked that the appliances weren't going to be installed that day. Could it be a Jedi mind trick? Then, music to my ears. Footsteps. That could only mean one thing, right? A crew was here to install the appliances. Good-bye cooking in the basement! Nope, just the carpenter to continue to build the cabinets. Earlier Thursday morning, I dropped a Pyrex bowl (not a tiny one, mind you) and it shattered in a million and ten pieces. I was in my PJ's and bare feet. I got a microscopic piece in my toe. Thankfully, Coach was still home. He cleaned up the mess, and eventually located the dot of glass in my toe that was making me crazy. This job was supposed to start in June. Yes, middle of June. Why do I care what other jobs they have? He shrugged at me when I asked if they would be out the next day. 'Oh, well tomorrow is Friday?' Again, WHAT THE HELL? Do electricians and plumbers not work on Fridays? Get them out here and get the work done. It would need to wait until Monday. Coach comes from casual stock. His siblings are not dressy people who expect the red carpet to be rolled out. Good thing, because we are hosting them for Christmas on December 23rd. I have warned them that they will have to pardon our dust. That doesn't mean though, that I am not going to try my damnedest to restore as much order as possible - even if it means I have to work myself silly on, I don't know, say a Friday! Unthinkable! Ughhhhh!! How frustrating! But your island is AWESOME! !